For those of you who use Facebook and Twitter, you’re likely to have come across the story of Lily Robinson, Sainsbury’s and why Tiger Bread should really be called Giraffe Bread. In case this internet sensation happens to have passed you by, allow me to tell you the story. Why is tiger bread c\alled tiger bread? It should be c\alled giraffe bread. I really liked reading your letter so I thought I would send you a little present. I’ve put a £3 gift card in with this letter, if you ask your mum or dad to take you to Sainsbury’s you could use it to buy some of your own tiger bread (and maybe if mum and dad say its OK you can get some sweeties too!). I first came across this exchange via a post on Facebook last week and it certainly made me smile! Personally, I’m a big fan of Sainsbury’s anyway but this only added to my delight. And I am certainly not alone! The letters first appeared online in June of last year when Lucy Robinson (Lily’s mum) posted to her blog Lily’s letter followed by Sainsbury’s response. The letters quickly went viral both last year and again this month. Bloggers have written about them; the photos have been shared on Facebook literally tens of thousands of times; the topic has trended on Twitter; Sainsbury’s say that “phone calls from customers mentioned the exchange and commended us for this great piece of customer service”; and BBC News, Huffington Post UK, The Sun and This is Money have all run articles about the story. This simple exchange has certainly made a big impact. 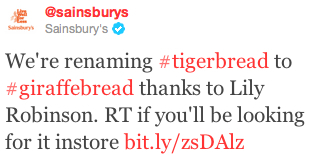 To such an extent that Sainsbury’s have today announced that they are renaming their Tiger Bread to Giraffe Bread and will be seeing how it goes. Reading Lily’s story reminded me of one of my own childhood experiences. I’m sure many of you know and love Kellogg’s Frosties and Tony the Tiger. One of the promotions Kellogg’s ran when I was a child featured a set of four Tony the Tiger water games. By collecting tokens from Kellogg’s packs, you could send off for a small plastic game that you filled with water. To play the game, you pumped buttons at the bottom that caused either small plastic rings or balls to rise through the water, hopefully landing on hooks or in holes that were your targets. I diligently collected tokens for such a game and sent them off, receiving one of the four games shortly after. So excited was I by this gift that I wrote a letter to Tony the Tiger thanking him for my present. In what was to me a completely surprising twist of events, I then received another parcel with a letter from Kellogg’s saying how pleased they were to hear from me and, as a show of their appreciation, here were the complete set of four games just for me. Much like Chris King’s response to Lily’s letter, this was such a simple act on Kellogg’s behalf but it is something that has made a big difference. As a child, I was thrilled to receive the games and Tony the Tiger seemed like the kindest tiger in the world. With age came the realisation that it was in fact Kellogg’s who had been thoughtful and generous but the story has stuck. Kellogg’s actions had such an impact on me that this is a story I continue to re-tell more than 20 years later (just ask Matt!). When I mentioned this story to my wife (@Jilltovey) she told me about the time when she, aged 8 or 9, wrote to Smarties to ask them why they had the answer and was sent a curt reply telling her it was “just a marketing slogan”. Again, the story has lasted. I’m sure we all have our own stories of great customer experience and times when brands have let us down. What has struck me reading about Lily’s story and being reminded of my own however, is how simple the acts are that make a lasting impact. It would be easy to dismiss a child’s letter or to send a stock response (just as Smarties did) but by taking a little time to respond to the child in a way they relate to, Sainsbury’s and Kellogg’s have both not only made two children (and their parents) very happy but have also created lasting memories and stories to tell for years to come. Isn’t this how we should be treating all our customers, both young and old? Reaching out to them where they are and delighting them in every interaction we have?